Imagine you want to build a Joomla website that will offer a six online courses to hundreds of students. The first step in this process is that these students will have to register at the College in the Clouds website. Each of these students will need to indicate what country they are from and provide additional information about which of the six courses they are interested in. This is where the logistical problems begin. The default Joomla Registration form is pretty limiting. Even if you activate the User Profile plugin, there is still not much in the way of additional information. It is very difficult to add additional fields to this registration form. It is also difficult to change the appearance of the form or add additional images or instructions and information to help users fill out the form. It is also difficult to export information from the form without actually going into the Joomla database – something which presents its own series of risks and problems. One option which addresses all of these problems is to use a free Joomla extension called Breezin Forms Free. They offer a free Joomla Registration form XML file which integrates with the Joomla Registration form functions but also allows us to change the appearance and expand the fields in the registration form as much as might be needed. We can add images, text, and a variety of field types. Best of all, data from this form can be downloaded directly to a spreadsheet for export to an Enewsletter email list or for other purposes without touching the Joomla database. This form also integrates with other important extensions such as Kunena forum. In this article, we will look at how to install and use this extension. First, we need to install Breezin Forms Free on our website. Second, we need to download the Breezin Forms User Registration and Login form. It is an XML file available at this link. Transfer this file to your website Extensions folder. Then extract the folder to see the XML file. To install a Breezin Forms XML package, open the Administrator of your website and go to components > Breezin Forms > Configuration. Scroll to the Bottom and Click on Package Installer. This will bring up the Package installer screen. Choose Upload Package from client. Then browse to the XML file on your laptop. Then click on the Install Package icon locate at the top left side of the page. If the transfer was successful, you will see a success report. Then go to Components, Breezin Forms, Manage Forms. Click on the Login form to open it and view it. Then click Save to activate the package. Note that the form file name is loginform. 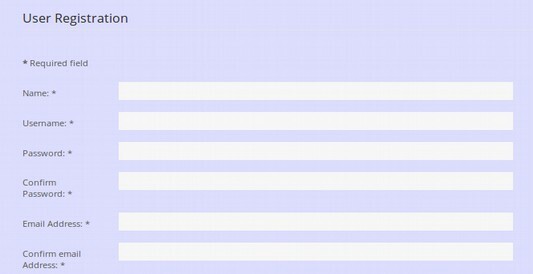 Next, to create a menu item for this form, go to Menus, Main Menu, New Menu Item. Then click SELECT. For menu item type, select Breezin Forms, Add Form. Give the menu item a Title, such as COURSE REGISTRATION. Then click on the Add Form tab and enter loginform as the form name. Then click Save and Close. In order to make sure that everyone uses this new registration form, unpublish the menu item for the default registration form. Then click on the new registration form to view its default fields. Its appearance will vary depending on your template and the Breezin Forms theme you are using. 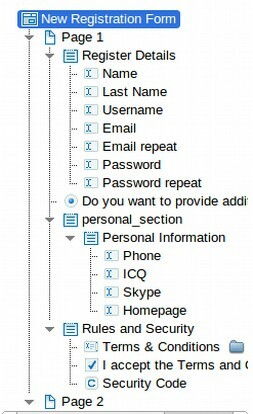 In order for the form to work, we should go to Users, User Manager, Options and change New User Account Activation to None. We should also disable any other user plugins other than the default Joomla User Plugin. Next, let's look at where the data is stored and how to export it. Go to Components, Breezin forms. Then click on Manage Records. Select the record and click on CSV to download the CSV file. Now go to your Downloads folder and look for a CSV file that starts with the name FFEXPORT. It exported everything except the password. After registering, Breezin Forms displays the following Thank You message. The problem is that we have disabled email validation. So there is nothing for the user to check. Thankfully, Breezin Forms new Joomla registration form comes with its own customizable Thank you for registering form. To change this, go to Components, Breezin Forms, Registration Forms and click on it to open it. Then click on Page 2. Then click on Edit. Add an image at the beginning of the form and then add Thank you for registering at College in the Clouds. We will keep you posted on upcoming courses. In the mean time, if you would like to ask a question, you can post it by clicking on the FORUM menu item. To save this text, we need to click Save. Then Save Properties, then Save. The final thing we need to do is customize our new registration form. Select the form, then click COPY to make a copy of the form and make all of our changes on the copy in case things do not work after our changes. Click on the copy to open it. Change its title to New Registration Form and change its name to new_registration_form. Click Save Properties. Then Save. Here is the Initial Structure of this form. We will leave the Register Details section alone. First, we will delete the question about wanting additional information. We will also delete the Terms and Conditions elements in the Rules and Security section. 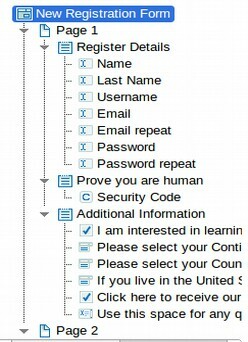 Then change the name of this section to Prove you are human. Next, we will add a couple of things. First, we will add a better Introductory message to our form. We will also add a list of the six certification levels. Also we will add an alphabetical list of countries that folks can sign up for and an alphabetical list of continents. We can add more field elements over time as needed. We will leave the security code section as it is. Finally, we will change the name of the submit button to REGISTER. Next, click on Page 1. Then click on Edit. Insert an image and some text on how to fill out the form and why the information is needed. Then click Save, Save Properties and Save. Then select Page 1 again. Then click on New Section. Make the new section type Field Set. Then call the new section Additional Information. Then click Save Properties and Save. Next select the Additional Information section and click New Element. For the element name, type interests. Then click Save Properties and Save. Then click the Additional Information section again and click New Element again. For the second new element, for type, use Select from list. For element name, type continent. For list , delete the existing sample values and copy paste the following. For the third new element, for type, use Select from list. 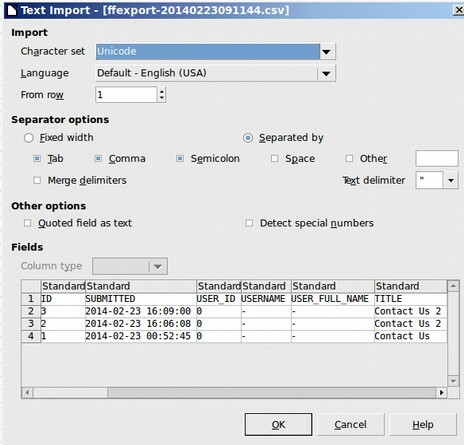 For list, delete the existing sample values and copy paste the following alphabetical list of countries. Here is the link to get the Breezin Forms alphabetical list of countries. For the fourth new element, for type, use Select from list. For element name, type in state. For the fifth new element, select Checkbox. For Label, type in Click here to receive our free email newsletter updates! For element name, type in newsletter. For the sixth new element, select Textarea. For the label, type in Use this space for any questions you may have. For element name, type in question. Then click Save Properties and Save. Here is our form so far. There is a problem in that the Prove you are human section should be at the end of the first page. The easiest way to get this section at the bottom of page 1 is to right click on Prove you are human and click COPY. Then right click on Page 1 and click PASTE. Then right click on the initial Prove you are human and click Delete. Then click Save. Please check which Continent you are on. Change the script to FF;ff_valuenotempty. Then click Save Properties and Save. Repeat for Country. Once we are done, we will change the name of the form in the menu item from BFRegistration to new_registration_form. To make the form a little more friendly, we will select the term Security Code and change it to Please type in the hidden word in the box below it. Do not change the name of this element. Click Save Properties and Save. Also we will also change the name of the Submit button label from submit to REGISTER. Then click Save Properties and Save. Be sure to test the form again to make sure it still works. Hopefully it does. Now we have a flexible registration form which we can change in whatever way might be needed over time and we have a form in which we can easily upload data to a spreadsheet to process in whatever way is needed. Now that we have our custom registration form we will explain how to extract data from Breezin Forms responses and records in order to use the information with other tools such as your Enewsletter. One of the primary reasons to create forms on your websites is to get feedback and build a relationship with your readers. But data does not do you much good if it cannot be downloaded to a spreadsheet where you can manage it and migrate it to other applications such as your E Newsletter. Thankfully, Breezin Forms data is very easy to download and work with. Just go to Components > Breezin Forms > Manage Records. The records are ordered in the table by the date they were submitted. To view any given record, click on it to open it. The Records table can be filtered in several ways. You can select All Forms or just records from any given form. You can select only Viewed records. You can check off the records you want to export. Once you have selected the records you want to export, you can export them in three different ways, PDF, CSV or XML. Install and then open LibreOffice. Then open a new LibreCalc document. Then click on File Open and use Libre Calc to open the CSV file. The following Import Data Window will appear. Click OK. Then delete any columns that you do not need. Next, we will review how to migrate a Breezin Forms Package from one website to another. This will save you a lot of work if you have multiple websites and you want to use similar forms on each website. Packages are a way of moving a Breezin Form you have created, or one of the default Breezin forms, from one website to another. Packages are created AFTER you have created some forms. There may be times when you want to copy one of your forms to another domain. Using BreezingForm's 'Package' option, copying forms from one domain to another is a BREEZE, as long as the other domain is running Joomla! with the SAME OR A NEWER VERSION of the BreezingForms extension. When you create a package, you are actually creating an XML file which can then be shared with others. To send it via Email though, you might have to zip the file first, as not all Email applications / webhosts will accept XML files. To create a package for installation on another domain, go to Breezin Forms Configurations Page. At the bottom of this page, click on Create a Package. This will bring up the Create Package Screen. Fill out the form using the following values. ID: Leave the ID section blank. Package Name: Give your package a file name (no spaces). Version: Assign a version number to your form. Package Title: Enter the title of your package (spaces are allowed). Author Name: Enter your name. Author Email: Enter your Email address. Author URL: Enter your website URL, if applicable. Description: Enter a brief description of your package and/or form. Form Selection: Select the form that you wish to include in the package. Click on Save File, then OK. This will put the file in your Downloads folder. Then move this file to the same folder as your other Breezin Form files and folders. Now go to the back end of the website you want to install the new form package to. It must also have Breezin forms component already installed. Go to Breezin Forms Configuration page and click on Package Installer. This will bring up the Package installer screen. Choose Upload Package from client. Then browse to the XML file on your laptop. Then click on the Install Package icon locate at the top left side of the page. If the transfer was successful, you will see the following report:. Click Close. Your form should now be accessible through the 'Manage Forms' link. So once you create a form for any one of your websites, you will be able to migrate it to any other website. This completes our section on forms. Next, we will look at how to add a Downloads section to our website.